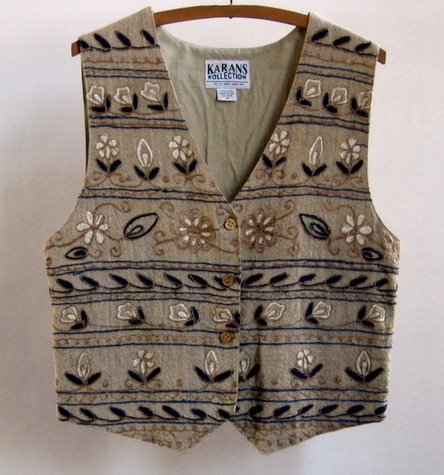 Casual vest in nubby loose-weave cotton with funky floral embroidery. Ground color is a neutral oatmeal, with decorative motifs in navy blue, white, and dark tan. Lined with matching cotton. Wooden buttons. Relaxed fit, with self-tie in back to gather waist and add interest. Looks great with jeans and casual pants. Shoulder seam to hem peak: 22.5"